The Fisgard Association was formed at Southsea on 15th November 1996 by twelve ex-Fisgard Artificer Apprentices under the inspiration and leadership of Bruce Balmain of the 1941 Grenville entry following a reunion he had organised the month before for ex-apprentices who had trained at Fisgard during World War II. Eight of the twelve 'founder Members' who attended that inaugural meeting agreed to form a 'steering committee' and unanimously elected Bruce Balmain, the creator of the association, as it's first Chairman. He has subsequently stood down as Chairman and was elected Life President at the AGM 2000. The aim of this 'old-school' Association is to bring together those who spent some or most of their formative years in Fisgard, an institution which bears the only name that has an unbroken history of being exclusively used for the education and training of Artificer Apprentices. The Fisgard Association in no way supplants the many associations formed by individual divisions and classes who trained at Fisgard, but is complementary to them. 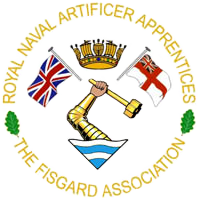 Membership of the Fisgard Association is open to all ex-Naval Artificer Apprentices who have served all or a part of their apprenticeship at any UK Royal Navy establishment. Honorary membership is available to the widow/widower of members if they so wish, they do not have to pay a subscription and can attend any of the Association social functions, but do not have a vote. If a complaint about the behaviour of a member of the Fisgard Association towards another member or the Association itself is received by the Secretary, he will immediately forward it to the members of the Conduct Board, who will deal with it in accordance with the published Conduct and Appeal Board procedure, a copy of which is available on the website and within Fisgardian 40. The general running of the Association shall be carried out by a committee of nine members consisting of: Chairman, Secretary, Treasurer, Membership Secretary, Webmaster, Fisgardian Editor, plus three non-office holders. All of these positions will be elected at the Annual General Meeting (AGM) by a show of hands. In the event of a committee post becoming vacant between AGM's the committee may co-opt a voting member to fill the position until the next AGM. Additional non-voting members may be co-opted to assist in the running of the Association. Two members of the Association will be appointed at the AGM as 'Examiners' to carry out an annual examination of the accounts. Trustees of the association may be nominated by the committee as and when required. All Committee posts attract no remuneration of any kind and shall be elected for one year at the AGM. The Chairman shall be responsible for the overall running of the Committee; he will chair all committee meetings including the AGM and the Annual Reunion Dinner. He shall be the sole contact between the committee and the Media unless he specifically delegates this task to another member of the association. The Treasurer shall be responsible for seeing that all monies, whether received by himself or any other member of the committee shall be paid into the association's bank regularly. He shall also ensure that all debts of the association are paid as directed by the committee. He shall see that accounts, documents and other papers relating to the finances of the association are kept. He will submit his record of Receipts and Expenditure to the appointed voluntary examiners in time for them to carry out the audit. He shall prepare a Balance Sheet and Income and Expenditure Accounts in time for the AGM. The Association is a non-profit making organisation and the Committee posts are unpaid. The annual subscription, proposed by the Committee and agreed by the AGM, is due on 1st January. For this, members will receive 3 newsletters per year and bi-annually a revised Directory. Expenses – Any member who in the course of his duties on behalf of the Association, necessarily incurs expenses, may then claim those expenses from the Treasurer on production of receipts as detailed below. Stationery – postage, paper, envelopes and ink cartridges – total amount of relevant receipts. Transport – Fuel for cars, the cost of the fuel used or public transport costs for necessary journeys. Accommodation – If a return journey home on the same day is not feasible, then the cost of a single night’s Bed & Breakfast at the RMC - £50.00 – may be claimed. All expenses paid by the Treasurer are authorised by the Committee and a report will be provided to the membership of all expenses paid to individual members at the AGM. There shall be a minimum of four Committee Meetings, including the AGM in each year. The AGM. will be open to all members of The Association but the Committee Meetings will not. There may however be an Association reunion following these meetings and an informal lunch. The Chairman may call extraordinary meetings of The Committee as and when necessary. Members will be informed of proposed functions as arranged by The Social Secretary and of those arranged in the Plymouth area. They will normally be booked using booking forms distributed with the newsletter. Guests will be welcomed to functions when 'Guests' are particularly referred to in function calling notices. Ex-Fisgard Apprentices, not current members of the Association, will normally be allowed at any time providing they show support for, and have expressed intent to join. Changes to the Constitution of the Fisgard Association may be made only by a resolution moved at the Annual General Meeting which secures a 75% majority of those present voting in person and those voting by written proxy. Any proposed amendments to the Constitution must be notified to the Secretary in good time for inclusion in the Autumn Newsletter distributed to all members in October. Changes of the rules of the Association may be made by a majority vote of the committee providing the proposed change has appeared in writing in the Agenda of the meeting concerned and been distributed to all members of the committee in good time. A minimum number of 30 Association Members are required for a quorum at General Meetings. A minimum number of five Committee Members are required for a quorum at Committee Meetings. In the event of a closing of The Association an Extraordinary General Meeting will decide on the disposal of residual funds.